The Friars of Saint Anthony are pleased to invite you to join them online to prepare yourself for the feast of our beloved Saint Anthony of Padua. Every day, from May 31st. to June 12th., they will release a video filmed at some of the most inspiring locations in the Basilica of St. Anthony in Padua, Italy. Fr. Mario Conte, OFMConv will present the series of 13 short video meditations about the figure and spirituality of the Paduan saint. Please also join them on June 13th. 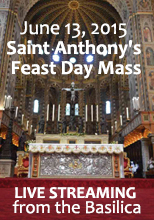 for Saint Anthony's Feast Day Mass, which will be streamed live, from the High Altar of the Basilica at 10:00 am (CET).